The newest addition to the Mirage product line-up is the Hobie Mirage Tandem Island, a 18' 6" Trimaran Sail/Yak that incorporates the patented Hobie Mirage Drive into a unique sailing machine unlike any other sailing craft on the water. The Hobie Tandem Island features a boom-less, roller-furling sail rig similar to the rig on the Hobie Bravo with plenty of sail area for excellent performance, completely manageable from the cockpit with the pull of a line. Two retractable amas fold up against the side of the boat for easy docking, maneuverability, and transport. The cockpit is a stable platform, expanded to a tandem, from the Hobie Mirage Adventure Kayak, offering full versatility as a pedaling kayak when conditions are not convenient for sailing. 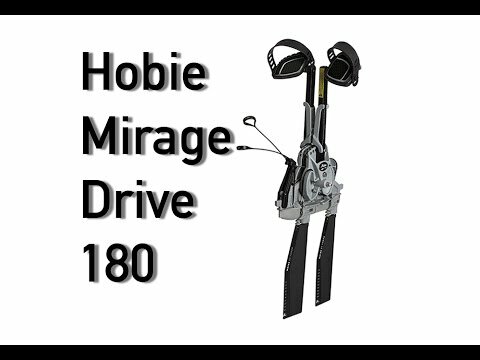 Hobie has upgraded the popular Mirage Drive to the Mirage Drive 180 for hands-free propulsion in both forward and reverse. The new Vantage CT seats have three height options and the ability to recline the seat back for all day comfort. The Hobie Mirage Drive allows the boat to be pedaled while under sail, or simply pedaled with the sail furled for versatility not found in any other sailboat. The Hobie Tandem Island is loaded with additional standard features such as a centerboard, over-sized Twist and Stow rudder, Turbo Fins on both Mirage Drives, mast and sail cover, and an ama/daggerboard bag. Fantastic craft, sails great in gentle and moderate breezes. ACK are fantastic, my deliver driver tried to get the wrapped kayak and large heavy box of accessories out of the truck alone and banged up the packages. A pad eye fractures on the hull and the sail got a small tear from a box staple. ACK very responsive and working diligently to resolve. You only get a true measure of customer service during adversity! Bravo ACK! Great quality. Easy to assemble. Sails surprisingly well and is quick in a breeze. I am going to have a lot of fun with my Hobie Tandem Island. We ordered a Hobie island tandem kayak through Austin kayak . I want to compliment them on their customer service. We a had a problem with the shipping of the original kayak but Austin kayak went over and above providing us with fantasticl customer service. They took care of our issue sent us a new kayak and kept in constant touch with us until the new kayak arrived. We love the Tandem island kayak . This is truly wonderful kayak for our family, it almost sails itself. I have only taken my TI out a couple of times, but it performs great on the water! I have been kayaking most of my life, and this is one of the best SOT kayaks I have ever been in. I am a big guy (6'5" and close to 300lbs) and it does great for me. The only cons that I can see are 1) the price is pretty steep (excellent quality, but marginal value) and 2) launching this kayak solo is a bit awkward, even with the trailer and/or plug-in cart. At 18.5' and 200+ lbs loaded down, it is doable solo, but not a lot of fun, especially in muddy or rocky/oystery areas. All in all, awesome kayak! The 2015 Hobie Tandem Island is the best thing out there. I now have the best boat on the lake and everyone wants to check it out. This is the last boat I will need. All the others (6) needs to go. Thanks Hobie for making such an awesome boat. I am so happy with the tandem island. ACK you guys did an awesome job coordinating delivery and recommendations for accessories. I give you guys a solid 10. This is a great product, I love my TI and all its abilities. The folks at ACK were great in getting me what I wanted. I bought a 2014 Mirage Tandem Kayak in March of this year. My wife and I took it out the first time yesterday. OMG, was it fun! We had 12 mph wind, and it was very easy to sail. We had no problem going anywhere we wanted to. If you have never sailed before, it's not a problem with this craft. It practically sails itself. Despite being beginning sailors, in no time we were sailing circles around buoys. It handles great. We loved it! Got 2014 in April and sailed 2 weekends per month till end of October. Wow lots of fun. I've sailed her in 30 mph winds with 4 foot waves, you'll need a wet or dry suit for cooler conditions and lots of sun screen for that great Hobie tan. Love that she breaks down to kayak or sails with the mono-hulls. I've owned lots of canoes, kayaks, sailboat, john, and speed. This is the most fun. 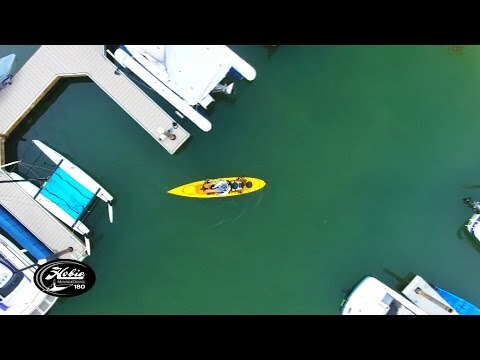 Incredible kayak! Easy to maneuver solo or with the whole family on board. Very safe and efficient kayak. I have never sailed before but was up and running in a few hours. Great trolling kayak. I have used in Florida fishing and at home on the lake. Was everything I hoped it would be and more. Incredible! Best designed and most fun boat I've owned, and I've bought and sold many. Love the Kayak and the quick delivery. One problem we are trying to get addressed is that on the first test ride one of the fins dropped into the lake and was lost. We did not expect this to happen on such a quality product. I love this boat. Easy to and forgiving to sail. Mirage drive is much better than expected (easy to peddle at 4 mph.) This much fun is well worth the price. Too much fun.. absolutely love it.. fast, fun, well designed, durable, easy to assemble and use.. An Absolute blast.. Well worth the money.. This was the best money I've spent in a long time. So much fun.. High quality, extremely well designed.. Durable, fast,fun, easy to set up, easy to use.. Very cool Sail Yak.. Envy of my lake..
pure fun... they thought of everything. handles easily!! just awesome boat. This thing is amazing, so much fun, so well thought out and engineered--and I've learned to sail! Q: Can you ship this to my address? I've bought items from you in the past but nothing this large. A: Hello, We are able to ship Hobie Items within the United States. Hobie Kayaks ship with our freight company we use called Estes Express. You can email us with specific questions if you would like to keep your questions private. A: Unfortunately all of the kayaks we have are 2018, so we do not have a papaya color. As far as shipping kayaks to your address, there should be no issues at all! Q: Is this model designed to be used, without the amas and sail, as a regular tandem kayak? A: Yes! 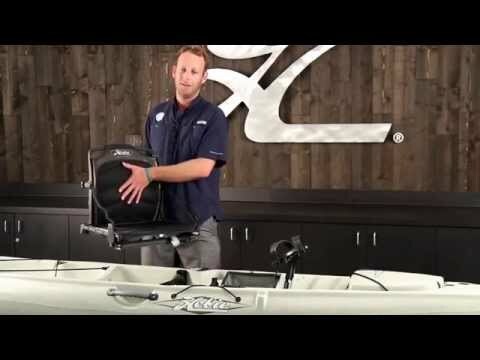 This kayak has many functions and setups making it very versatile. A: That carts can be used for the Tandem Island. However, it is recommended that you use the Heavy Duty plug-in cart with the plug-in cradle for the Tandem Island. Using the cradle will disperse the load rather than having it focused on 2 points of contact. Please let us know if you have any other questions! Q: Tennessee requires registration of sailboats. Can you supply me with the documentation that is needed for registration if i buy a tandem island from you? Q: can i get a trailer for this?